We are offering Pendulum Water Slide to our client. 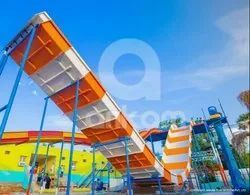 We are manufacturing of Water Slide Equipments.We are offering Float Slides, Racer Slides, Family slides, Thriller Slides, Pool Slides, Kids Slides.These Slides are having different attractive colors.This product is manufactured as per customers budget and space.We offer a wide range of Theme Water Fun Play Systems and are available in various themes. We are the company engaged in Manufacturing and Exporting a wide range of Water Slides and Water Park Equipments and guide every aspect of Water Park project in terms of Planning, Designing, Constructing, Engineering, and Commissioning. Looking for Pendulum Water Slide ?